We can cope with your close demand. We can install cooking facilities.You are reliable anytime because you can confirm the kitchen. It is a system used well in the world, but some problems are thought about. 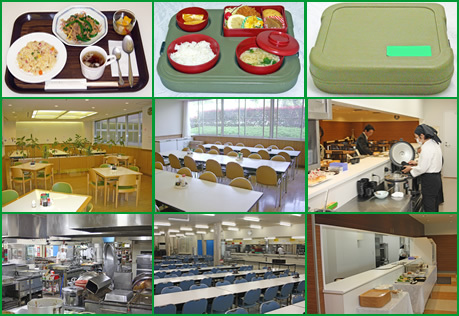 Because an operator puts materials in the hospital and cooks it in a kitchen, the operator must pay attention in air-conditioning and the hygiene side very much. Repair and the maintenance check of the kitchen will take time and money regularly. It is different by contract, but the recruitment and education of the people are very difficult things. In Japan, it is used a lot by a municipal institution or the prefectural elementary school or junior high school. You are not troubled with the recruitment and education. You are troubled with the supply of the substantial cooking ingredient and a stable amount of money. We can promise a stable cooking ingredient supply and amount of money by contract. ３．I make cooking in the factory of my HACCP specifications. And I bring it with me by car to a hospital. Our technology progressed.I send a fresh one.The problem of 1 and 2 is settled, too. You can use the large space of the kitchen for the purpose of others.It is a future main system. The factory of HACCP type that can support is very precious.Because technology and the latest factory are necessary.